Let's be frank: for all its charms, Ahista Ahista feels a lot like a practice run of Jab We Met - or, if you saw them in the order they were released (which I did not), Jab We Met feels a lot like a much improved final version of Ahista Ahista. Writer Imtiaz Ali did a much better job the second time around, so I guess I can't complain that he rehashed the basic idea into a funnier, tighter, more charming, more satisfying project a year later. Ahista Ahista now suffers additionally under the weight of comparison to Saawariya, the much worse Hindi version of Dostoevsky's story "White Nights." It's very unfair to think of either later film when writing about Ahista Ahista, and I'll do my best to put them aside. On its own terms, this is an unsatisfying story - because I am a romantic softie and the movie yanked away the parts I most wanted to cuddle - about interesting people, supported by some shining performances and character writing. I want to get the one exception to this praise out of the way. I don't know what Ali and director Shivam Nair were thinking with Soha Ali Khan and her character Megha in the first half of the movie. She sits, stares, and hardly speaks. Megha has gotten herself into a bad situation through sheer stupidity, and the movie does nothing to challenge the idea that she is the biggest fool in Delhi. I don't like thinking a heroine is stupid, but there was at least an hour of run time when I could do nothing else. Yes, she's in shock, and yes, she's been dealt a very low blow, and yes, I suspect she's supposed to be very young and naive, but she's also put herself in a lot of danger. She's pulled a Lydia Bennet without even the tie to shady Wickham. Sigh. I kept hoping she was running a con, anything to explain why anyone over the age of fourteen would act like this. Anyway. As a result of this writing, all Soha gets to do is sit almost comatose, unthinking and looking forlornly wistful or wistfully forlorn. See Soha sit. Sit, Soha, sit. Pretty. Sad, Soha, sad. I'm not sure I have a better idea how to establish Megha's character if she had to be like this, but I sure didn't like her. The corollary to pathetic Megha is that Abhay Deol's Ankush flirts with being a savior, a trope that also pisses me off. At least he means well, and he's quite honest that he feels good getting to help her. Most importantly, their friendship eventually becomes a genuinely two-way street, so I was willing to let go of my crankiness at this medieval gender setup. Anyway, please, moviedom, fewer simpering women (especially after Sonam Kapoor got mired in a whole new level of similar muck). are engagingly written. The friendships among Ankush and the other guys in the street (friend Zulfu, Pipney the band leader, the phone booth operator, and the chai-wallahs) are very dear. They formed a great make-shift family, trying to help Ankush grow up and making him be a better person - which he needs, because he's actually not that nice of a guy except to Megha. I was also touched by the resonantly awkward start of Ankush and Megha's wobbly romance. Finally, love in a library! Actually, I should call it "Ankush's romance," as Megha has very little agency or voice in it. If memory serves, the love songs are in his head only, and she doesn't even sing in them. There's good reason for this, of course, but on behalf of Ankush and easily confused romantics everywhere, I wish Megha had honestly examined and expressed her feelings to Ankush a lot sooner. While Ahista Ahista isn't a one-man show, Abhay has the richest part. He fills doofus Ankush with dil-squishing hopefulness, truly going zero to hero in the ways that count. Aspi told me two years ago that Abhay Deol should be my new FPMBF. He was right. Although I was sad for Ankush when the close of the movie showed him at basically the same spot where he entered (and in the same yellow and black plaid shirt, I think), I know he had matured and learned important things about himself and how to treat other people. Where's Ankush? Far left, two people above the guy in the white hat. It wasn't clear to me whether his physical setting at the end meant he had given up his new career and, more importantly, his belief in and action on his potential. I hope not - that was the best part of the story! 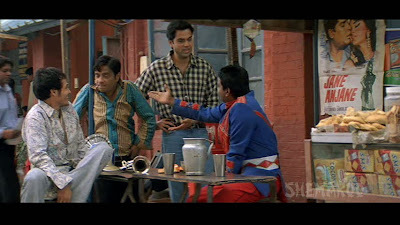 I'm loving Abhay Deol in roles like this that let him be goofy, as well as his other skills. Ankush's spats with auntie are the movie's funniest. But oh, sweet heavens, please tell me he has gotten better at lip-synching his songs. He was surprisingly unconvincing here. The already schmaltzy "Tum Jo Mile" was even worse to look at than it was to listen to. Yech. I do know a few women whose minds seem to have atrophied as teens, but to see *only* such women in movies is driving me away! I felt that Socha Na Tha's male character was JWM's Geet's counterpart. Only that dumb, OTT women seem cuter to both sexes than a confused guy! 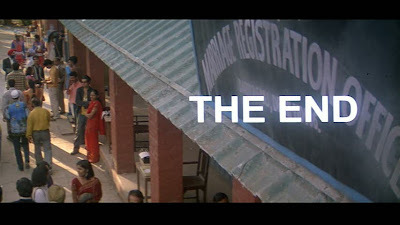 I started this movie but I could not finish it..All i remember from those first 10 minutes is Soha's character jsut sitting around all forlorn. 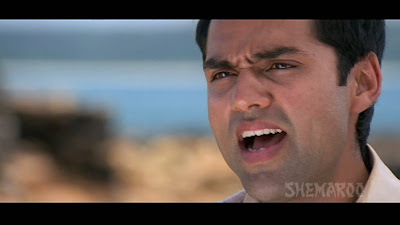 I should have continued at least for Abhay Deol. The soundtrack was supposed to be a highlight of this film when it came out and was quite popular. My sister makes fun of me becuase i change the channel everytime it comes on tv, i hate them. I'm sure it has to do with Himesh's voice. which I hate. 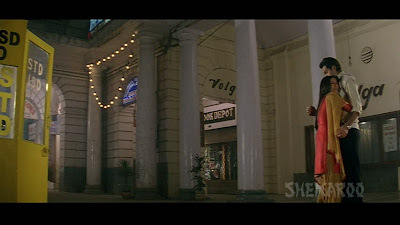 Of course I love this movie- this is the 1 movie that made me begin the blog- though I never wrote about it- couldnt get over Abhay being jilted for that ratty Shayan Munshi. :D Abhay is so bright and smiley and perfect! 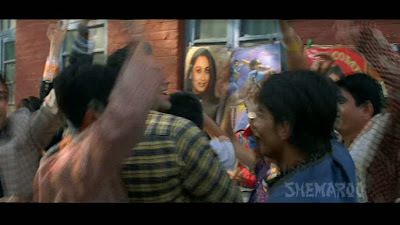 That said, the screenplay is perhaps flawed- because Soha and Abhay do look sweet together I think. And I thought JWM was an extension to Imtiaz's own Socha Na Tha !! And I think, this is a remake of a southie. Soha+Abhay looks yummy. Hummmm...need to watch this. Very very good point about lack of diversity of heroines/female characters! I'm going to have to think about that one. G - Gotta tell you, my hackles are up at the idea that dumb women are cuter than dumb men. (Not at YOU - just at the idea, which obviously you're just reporting on.) That's one of the things wrong with the world, frankly. Dumb should never be cute, and dumb women, whether real or characters, just hold us all back. JJC - Enh. I'm not sure you missed much. I too hate Himesh's voice with a flaming passion, so I think your channel-changing behavior is totally understandable. Shweta - The plot in this is indeed frustrating. If Megha had seen more of Ankush's not-as-nice side, like he showed to Zulfu, I could understand her returning to her much longer-standing love for whatsisname. But Ankush was always great with her. Well, actually, once the truth of whatshisname's absence came out, I guess I can understand that too - didn't someone say they'd been toether for 5 years? Anyway. It was really sad. Darshit - I agree, they're a good combo. I seriously think Soha should take some acting lessons.